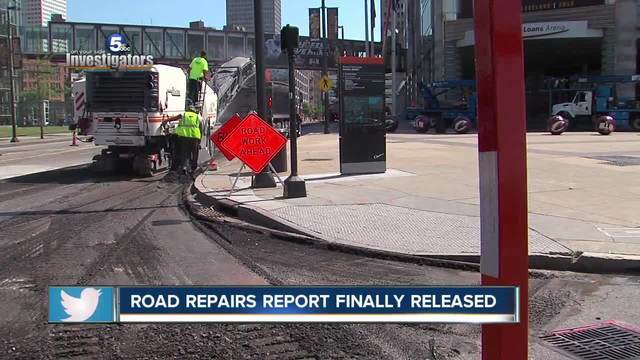 The City of Cleveland discussed Tuesday a crucial road report that News 5 has been requesting for almost a year, as part of our investigation "Broken Roads, Broken System." Last August, we reported that the rating system the city was using to grade more than 16,000 Cleveland streets -- to determine which streets were a priority to fix -- was 9 years old. INTERACTIVE MAP | See what grade the City of Cleveland gave your street . We then learned that the city commissioned a new, complete analysis of its roads costing $600,000. But when we requested that analysis in April, we were given the run-around from the city. In December, the city told us that initial report was filled with flaws and, because of that, the study, conducted by engineering firm Michael Baker International, was months behind. At the time, Cleveland’s Chief Operating Officer Darnell Brown told News 5 that Michael Baker International used the wrong evaluations software. The city’s Director of Capital Projects Matt Spronz said the engineering firm should have used the local program for evaluating streets instead of the flexible program. The new report, or Pavement Management Study, was released to News 5 first on Tuesday and re-affirmed that information. The original 2008 report had many errors and "presented challenges to the collection and reliable interpretation of the survey data." The city later said that they did not consistently use this list -- a study that cost taxpayers $400,000. The new report documented 10,000 street segments with three survey teams comprised of two people each to grade the roads by assigning them pavement conditions ratings from 1-100, or A-F.
READ THE ENTIRE NEW REPORT HERE. According to the new report, 30 percent of residential city streets got a D grade and 9 percent have been given an F.
But in this report, instead of a 90, 80, 70 grading scale, the street could have a 76 rating and still fall in the B category. Almost 80 percent of streets show "serious distresses" because of patching. That's when a street has to be cut up to be repaired or pipes underneath need fixing. One of the biggest takeaways from the new report is the city's decision to shift from a flawed "worst first" philosophy to a "fix it first" strategy when it comes to repaving roads. News 5 questioned this shift in strategy at a news conference called by the city regarding the new study after continuous questions from News 5 about the state of the city's infrastructure in 2017. This also came after our initial investigation found the city's original street maintenance system was fundamentally flawed. In the 2009 study, we found more A, B and C graded streets compared to D and F streets were repaved, which led to residents questioning the city's methods and when their own streets would get fixed. Brown said the city is working to combat this by shifting from "worst first" to "fix it first" philosophy. The latter incorporates a much more focused effort on maintaining the streets that are in good shape. "Repairing is one thing -- keeping it that way and not letting it deteriorate faster than it should is another," said Michael Cox, director of Public Works. As part of this new approach, the city also said that it will only continue with the "worst first" method until all the F graded streets are re-done. Our investigation revealed the worst first philosophy is an aged one that national experts deemed inefficient for long-term preservation of roads. "The old business model is really outdated," said Larry Galehouse, founder of the National Center for Pavement Preservation. "We need to stop up and preserve our infrastructure and investment." Brown emphasized there will be a slow integration of this new strategy over the next four to five years, and the city committed to fixing all F streets. During the 16-month-long process in which the streets were surveyed as part of the new report, the engineering firm found $37 million worth of streets that need to be redone. The city said it's committed to doing all of those streets first including this year's budgeted $10 million. "The only deviation I see is which of the streets that have a 49 rating (an F) gets done first?" Brown said. The city also said that council members will not be adding their own streets to the list of those that will be repaved, despite a past strategy that allowed them to provide input on which streets they wanted fixed in their respective wards. The city's overall goal is to have every street with a "75" rating, or in the upper "C" grade range, in the next 20 years. The city's grading scale considers a street with a "75" rating to be in "good" condition, Brown said. 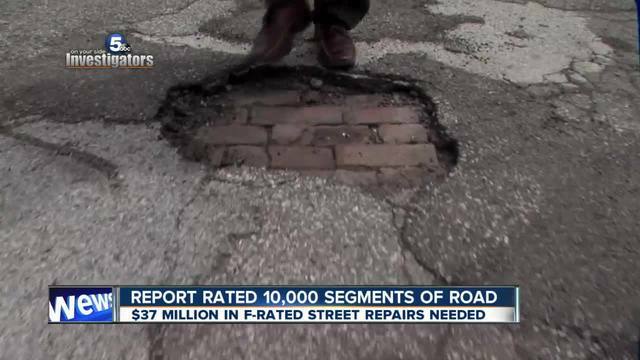 Meanwhile, officials said they will evaluate a third of the city's streets every year to stay on top of what roads need to be fixed. "As we go every year, we will be updating sections of it...because the pavement condition ratings constantly change," Spronz said. News 5 also learned the city plans to commit more funds to road repair and maintenance than it has in the past, including upping its funding for local resurfacing. When it comes to resurfacing, the city spent $4.4 million in 2014, $7.5 million in 2015 and $10 million last year. The new report recommended the city spends between $12 million dollars and $18 million dollars each year to improve its local streets and reach its goals. So we asked city officials how they plan to pay for it. "I wish I could answer that question today," Brown said. "My short term goal is to fund 2017-2018." One possible solution the city discussed is that utilities, including the Cleveland Water Department, would pay a portion of the street resurfacing bills after installation of new and repaired pipes. The survey teams drove each section of pavement at a pre-determined maximum speed of approximately 25-35 mph, and using a combination of observed distresses and ride quality, rated the section. Readily visible distresses such as potholes, bleeding, settlement, faulting, spalling and surface deterioration would be rated. Ratings would include assessing both the severity (low, medium, high) and extent (occasional, frequent, extensive) levels for each distress. As needed, team members exited the vehicle to inspect the condition of pavement where it was obscured by debris, parked vehicles, or high traffic volumes. A second pass along the roadway section was occasionally necessary to determine ride quality. The presence/absence and condition (best, good, adequate, poor, worst) of curbs and (best, good, traversable, poor, worst) sidewalks were also recorded for each roadway segment. This included addresses of sidewalks that were in extremely poor condition, primarily due to tree root disturbance. View the maps below to see how some of the city's streets were rated.